This year Google has proved that it is the master of celebration . We all saw the LET IT SNOW thing in Google , when we type LET IT SNOW the whole screen starts to cover with snow flakes, it was the first surprise from Google for this Christmas and one more surprise that excited Google users is the YouTube video snowfall ! 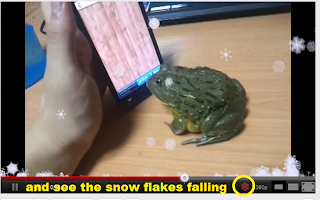 To enable the snowfall in YouTube videos , there a snow flake icon in lower right corner , just click on it and see the snow falling from top you can play with the snow flakes with your cursor the snow flakes at end gathers below and makes a very pretty effect.